Consider the Mandy’s phenomenon as a fine retail example. Mandy’s offers clients fresh high-quality, high-end salads prepared in ways you’ve never dreamed of. 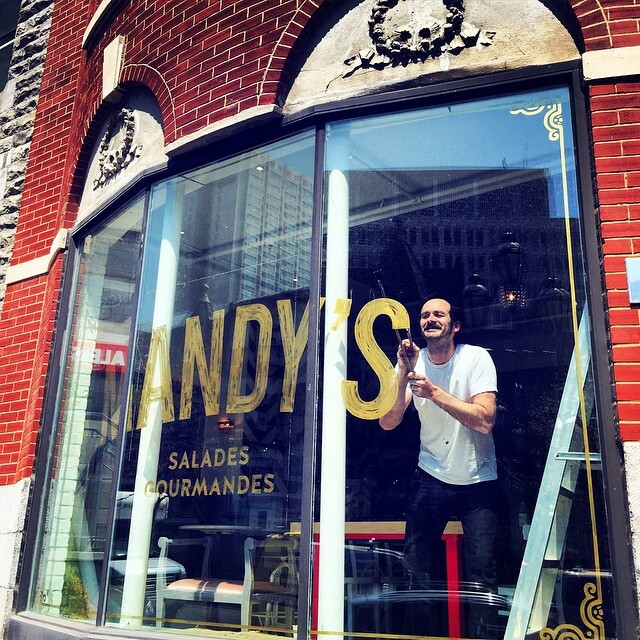 If you’ve had never heard of Mandy’s, you might have been puzzled that people would drive from downtown Montreal to its Westmount or Laurier Avenue locations only to spend the rest of their lunch hours lined-up to buy a salad for lunch, or then again for dinner. For the downtown business and university crowds, driving to Mandy’s is now a thing of the past, Mandy’s new flagship salad boutique opened on Crescent Street earlier this year. When sisters Amanda and Rebecca Wolfe decided they ought to open downtown, they quickly realized it would be a very bold and costly move, one that had the potential to jeopardize the success they’d worked for 12 years to attain. Even if one of their locations is at the rear of a clothing store, existing operations were doing great business in their respective neighborhoods. Was Mandy’s a concept that would really fit the downtown environment and could it begin to generate the traffic ? The bleached wood décor and black & white family photographs hanging on the wall make you feel like you could be somewhere on the coast of Maine, or in Cape Cod standing next to someone from Boston here to enjoy the beach for the weekend. But despite the upscale image projected by some of the shops in these two neighborhoods, Mandy’s atmosphere is definitely warm and unpretentious. For the downtown project to succeed, it was clear to me that the new location would have to be an extension of the Mandy’s brand, one that reinforces if not maintains its unique image. I realized that if it were anything less, fervent Mandy’s clients might stick to the existing neighborhood stores or worse, new clients might not even show up at the new store. After all, with the array of global brands located downtown, how often does a neighborhood phenomenon become a roaring success downtown? As I started identifying potential locations, it became abundantly clear that the last place Mandy’s needed was to be located amongst others in the vast ocean of eateries and fast-food joints. Even if a high-traffic location on Sainte-Catherine Street was alluring, the risk of associated anonymity was present. Mandy’s offers a premium product for the price, so why risk diluting this image among all the clutter and chatter of the national brands. Since I was impressed that existing clients treated Mandy’s as a destination, I concluded that not only could the new store be located off the beaten track, but this could in fact reinforce the uniqueness of the Mandy’s brand. A key point I had to remember is that clients came equally from offices and universities, so proximity to both had to be a key consideration. The Crescent Street area had all the markings that were right for Mandy’s. First, it has a neighborhood feel, the brownstones and grey-stone buildings, boutiques and bars have contributed over the decades to making Crescent Street an area sought out by locals but equally well-known by out-of-towners. Until a few years ago, a long strip of buildings on the east side of the street was home to L’Oréal Group’s Canadian headquarters – I remember when the Paris-based company executives refused to a move elsewhere in Montreal, because the Crescent area reminded them of home. However when the company finally left, the north end of the street regained its forlocation mer popularity, boutiques re-opened between de Maisonneuve Blvd. and Sherbrooke Street. After some tough negotiating for the tenant’s benefit, Mandy’s secured its Crescent Street location allowing it to create a flagship operation with a kitchen large enough to satisfy its catering and delivery service, yet maintaining a boutique look and feel. At peak hours line-ups go outside the main door, down the stairs unto the sidewalk. Amanda Wolfe says “Our results on Crescent Street are beyond our best expectations!” When I ask if the Crescent location has hurt business in the neighborhood locations “Not at all, business is up everywhere because the Crescent Street presence has bolstered brand awareness”. For more of the tangible results I obtained in the Mandy’s lease transaction, check out the Mandy’s case study. So although old bricks and mortar contribute to the décor of Mandy’s new downtown digs, the right real estate transaction needs to support business objectives and enhance competitive advantage. Ask for the Asian or the Man Salad !